Raising voice against the granting of Citizenship to Chakma-Hajong refugees in northeast, the Tangsa Students Union(TSU) on Monday has appealed to State Government as well as Central government not to play with the sentiments of people of Changlang area by granting citizenship to Chakma-Hajong refugees and affirmed to fight “Tooth and Nail” to save its people. 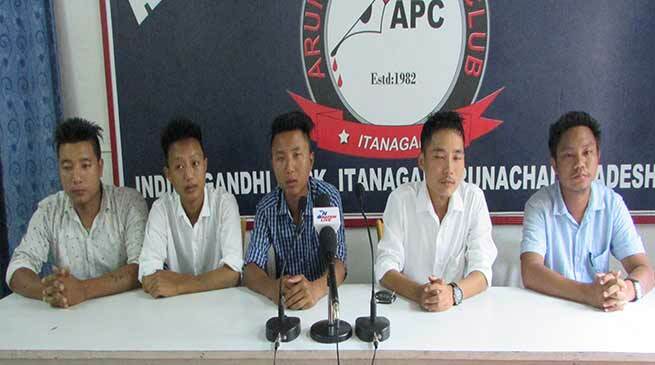 Asserting that the local indigenous populace has become minority in their own area, Advisor ATSU, Mengpa Haisa in a press conference held this morning at Arunachal press club has informed reporters that the Chakma Hajong outnumbered the local populace and becoming a threat to very existence of indigenous people living in the area. Demanding the government to confine the refugees in a new designated place, Haisa disclosed that more than lakh of population of refugees currently living at Changlang area while local people are numbered only in thousands. Their population is increasing day by day as district administration machineries failed to check the influx as there are no proper ILP checking conducted in the few check posts, he added. “Even the refuges didn’t spared the Namdapha National forest, which has been since long illegally occupied by them and forest products have been destroyed. There is also increasing crimes related activities registered against refugees in various police stations in the district. But even after knowing the plight and suffering of our people, the state government is yet to draw any promising measures to save people of the area, he added. Also pointing out biased viewpoints of Human rights organisation, Mengpa alleged that human rights organisation just giving their blind support to refugees while neglecting the ground realities and without knowing the suffering of peoples. He questioned when the refuges is creating law and orders problems then there is no one to question them. But when we the local populace protest against such atrocities meted towards our people then why again these human organisation start questioning and alleging us for inflicting in-discrimination towards them. We are living in the lands since ages and we will definitely fight against anything if is threatening our integrity, our land and people,” he added. “We are peace loving people and maintained enough silence since last few decades thinking the government will solve the issues including the central government. But this time we will not vow down to Supreme Court verdict as the decision was not taken considering the interests of local populace. We will go to any extend to save our land and rights,” he affirmed. Furthermore blaming the successive government for the blunder, he also made appeal to political leaders to not play blame-game at this moment and do not try to give political & religious colour on the issue rather solve the issue unitedly to protect the tribal’s right before it’s too late.